I have been privileged to collaborate with my brother, Don Marsh, orchestrator and producer, in recording albums which continue to be the top best-selling instrumental albums in Christian music: Hymnworks I and II, Symphony of Praise I and II, Hymnworks Christmas, A World of Praise, Rhapsody of Love, and Rhapsody of Christmas I and II. Moments with the Savior, recorded with the London Festival Orchestra, received a 2000 Dove nomination. Through this avenue, Don and I endeavor to reach a broad spectrum of worship traditions and musical tastes. These piano and orchestra recordings have brought peace and inspiration to hundreds of thousands of listeners over the years. 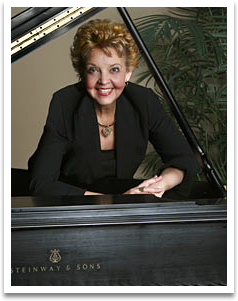 In September 2005, I recorded the Reflections CD in conjunction with my husband, The Rev. Dr. David McKechnie (Dave) in celebration of our 25 years of ministry at Grace Presbyterian Church, Houston Texas.This is a devotional CD with Dave's readings from the Word accompanied by my piano arrangements. Worship Collage is my debut album recorded on a new label, Cool Springs Records, which was released March 2006. This instrumental CD is a collage of hymns with classical and original themes played in a very inspirational and worshipful way. I love to share my music in the concert setting or leading worship for a renewal conference. Other opportunities would be piano and orchestra concerts, special events in your church or city, women's conferences, or keyboard workshops. I enjoy the interatction with the audience by inviting them to sing along or by simply explaining how the hymn tune relates to the classical theme. My hope is that this would be an unforgettable experience that heightens appreciation and love for the texts and melodies as they are performed in a new and refreshing way. When I share my personal witness of encouragement, I love the reaction to "I was 49 when I signed my first recording contract. Never underestimate God's plan for your life....no matter how old you are!" it is a personal goal to make the keyboard music arrangements available from my recordings for others to play for weddng music ideas, string quartets, orchestrations, and handbell music. 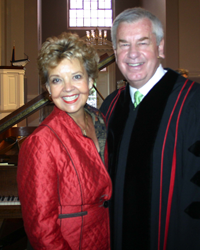 Linda and Dave have shared in ministry at Grace Presbyterian Church, Houston, TX for 25 years. In the Fall of 2005, Dave retired from the pastorate at Grace. However, he had a passion to educate and mentor young pastors for the 21st century and became the President of the Texas Theological Foundation which launched an extension of Fuller Seminary (CA) in Houston. At the same time, Dave served as Interim Pastor of First Presbyterian Church, Houston, TX for 3 years. In 2011, Dave accepted another interim position at Eastminster Presbyterian Church in Wichita, Kansas. God still had more plans- In January, 2012, Dave was called to Bel Air Presbyterian church in Los Angeles- to be Head of Staff (130 people), Session, and main Preacher of the Word and Sacrament. To watch his sermons, go to www.BelAirPres.org then go to "media". In 2014, Dave and Linda moved to Charlotte, NC to be closer to family. In 2018, after a 2 year Interim at Sardis Presbyterian Church in Charlotte, he started his 5th Interim at Carmel Presbyterian Church in Charlotte. A legacy for Linda- As a past President of the Handbell Musicians of America, Linda realized that ringing handbells could be accomplished by anyone, even the functionally challanged. Linda launched a handbell program at the Brookwood Community outside Houston, TX. Although they are non-music readers, there are several teaching methods that are used. Recently, the Brookwood Handbell choir played the National Anthem at an Astros Baseball game as well as performing for the Houston Grand Opera Gala. These videos can be veiwed at www.BrookwoodCommunity.org under "community" or on YouTube. Linda has written resources and handbell arrangements for the Special Needs community and enjoys teaching others to start similar choirs. Dave and I have been blessed with a wonderful family. My family is a gift from God. They have supported me in every way as I added “recording artist” to my “wife, mother, and grandmother” titles! Our daughter Sheri (Joseph) and Michael, live in Charlotte, NC with their sons, Ian and Reid. Our son, The Rev. Peter McKechnie and Mindy, live in Knoxville, TN with their sons Baker and Bo.